The stakeholder’s forum on engagement for the preparation of a preliminary master plan for Lamu Port City and investment framework took a twist after leaders and the Lamu people claimed that they have been side line by the authority. 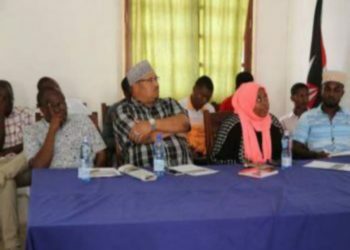 The forum which was held at Mwanaarafa hall yesterday brought together Lamu political leaders, Lamu community and the representative from the Lapsset authority. People were concerned with the way things are done without their knowledge. A number of issues were raised include the promise by former president Mwai Kibaki to provide 1000 scholarship for the Lamu youth which they claimed only 400 students have been listed so far. On fishing,which is a source of lively hood for many people in Lamu disagreed on the closing of Mkanda channel or be forced to wait for one hour for the big vessel to pass. Also, the fisherman asked the Lapsset authority to compensate them in cash in oppose to the plan to buy for them fishing equipment. On her side CEC for land in Lamu County, Fahima Arafat assured the congregation that the executive and the Lamu county assembly will work for hand in hand to make sure that the Lamu people get their right. She also proposed to the authority that they should conduct public participation forum inward level in order to reach the common mwananchi in the grass root level.